For those of you familiar with the Tales series, you know what Namco has established in the series--a very high quality real-time battle system, fantastic visuals and character development, and a great RPG experience all in all. Tales of Legendia definitely shows it's similarities to that of Tales of Symphonia, released for the Gamecube (and PS2 in Japan) in summer of 2004, and players that enjoyed that release will enjoy this one as well. 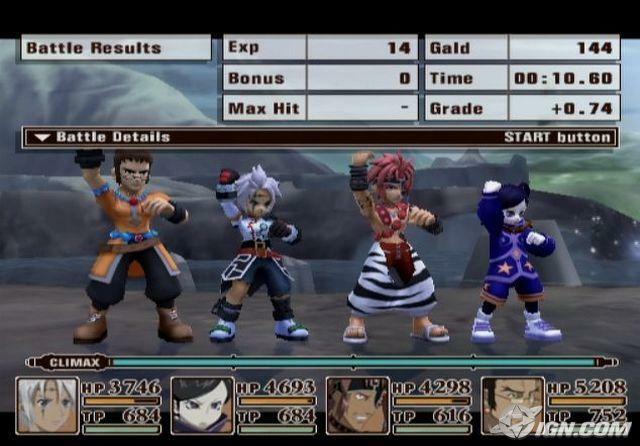 The battle system in Legendia is in all real-time, allowing you to select from three modes to control your character. Manual mode allows each action in battle to be controlled by you, semi-automatic allows you to do the attacking, but the game adjusts your distance from enemies, and auto mode controls your character for you, depending on the strategy settings you apply. 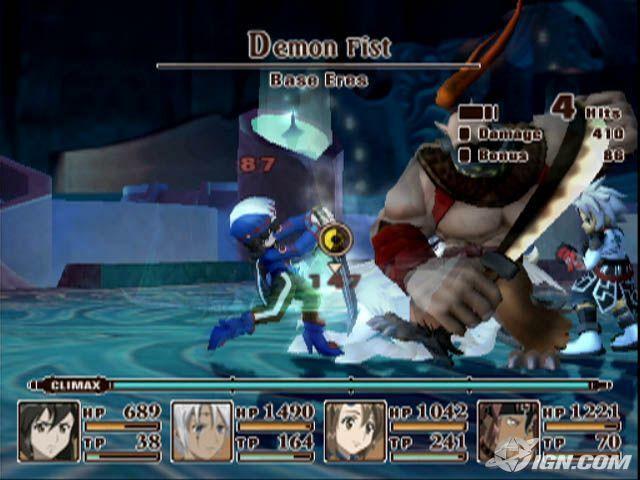 Instead of being on a 3-D type plane field as in Symphonia, Legendia's battle system is done entirely on a 2-D backing. You might be interested to know that the battle system was put together by many of the same programmers who work on the Soul Calibur series. Combo elements drive the battle, and you are awarded with greater damage when completing larger combos. The magic system is driven by a power called "eres," and depending on the character, will grant you new melee or magic attacks as you level up, each of which are upgradeable. I enjoyed that fact that as you develop your character, many of the eres attacks you gain are actually combinations of prior attacks, making for some very entertaining moments in battle. After unlocking a particular attack, you can combine 3 different attacks manually to create a sort of "super power" to use in battle. Because of the innovative battle system, a lot of the less powerful attacks will grant you larger combos, forcing you decide on just what is the best combination of power and hit rate combinations. The combo system is emphasized mainly because of its ability to "paralyze" the enemy as the combo is active (this will come in very handy for some of the tougher boss battles). Customization is definitely one of Legendia's strong points. Anything from your character's titles, to exactly which magic attacks you would like the A.I to cast is totally up to you. 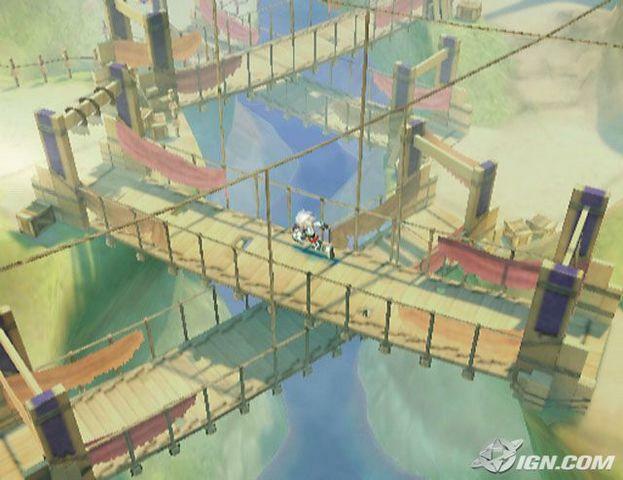 Players will also recognize the "cooking" system that was alive in Symphonia. You can use different pieces of food to create meals which will give you large HP and MP bonuses. Combine tuna, bread, and mayonnaise to create a sandwich that will supply 30% HP to each member of your party. As the game develops, you will unlock new recipes and new foods to use. Many other opportunities arise for fine tuning the experience, but I will let you see those for yourself! Random battles are placed quite often, which is actually a bonus because many of the battles you face could be done in less than 15 seconds. On the opposite side, many of the tougher boss battles could take you as long as 5-6 minutes, despite the real-time aspect. However, having the battle system be completely interactive, you don't pay too much attention to how many enemies you are facing on the whole. Sporting a very fine-tuned anime style, with cut scenes pushing the story thorough critical moments, the graphics are very rich and highly colorful. Dungeons are very detailed, as well as the enemies and characters you encounter. 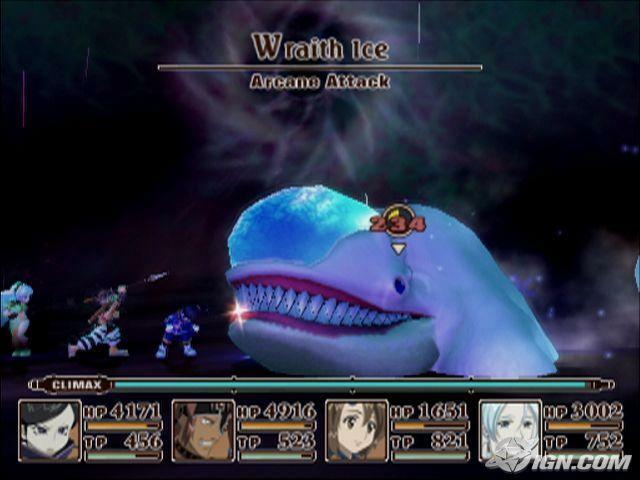 Having the battle system on a 2-D plane may discourage many players towards the RPG format, but it actually suits the game quite well. First off, the voice acting is near perfect. Each character is very highly developed and matches their given narratives quite well. Many scenes are very entertaining, as characters have a great combination of dramatic and comedic lines. I was also pleased with the "chatter" you encounter in mid-battle. If you heal an ally, a shout of "Thanks" is thrown, or if you drift too far away from the party, you may hear a "don't go too far!" from another member. 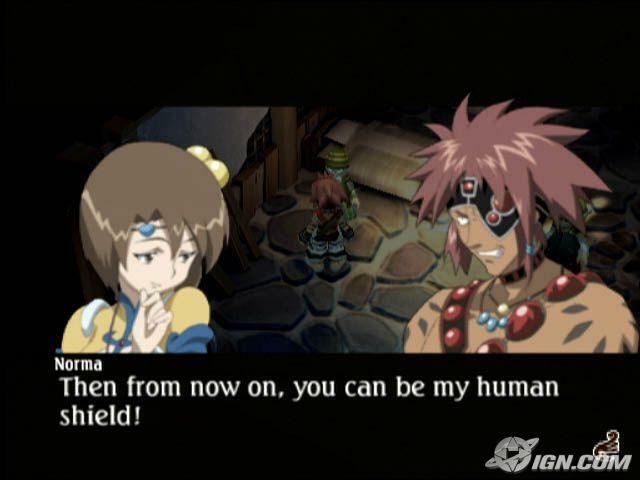 It all comes together to allow you to develop quite a strong bond to the members of your party. Perhaps the one complaint I had is that the comments your characters will make are quite repetative to say the least. In any given battle, you might here the phrase "eat this" about 15 times. It can get a bit old. Music is also very nicely done, with very strong orchestra-style themes, mixed with a lot of jazz, classical, and even rock themes. Battle system themes are heavy, increasing tension, and music you encounter while roaming your hometown is very reassuring with its classic style tone. In total, there are about 6 main themes, each of which you will definitely be humming by the end of the game. IT'S THAT GOOD. Although Legendia isn't the longest RPG you'll play, the rewards are high. The original story will typically last around 35 hours, depending on how much you choose to explore dungeons and develop your characters. Finishing the game will unlock separate side missions for each character, easily upping the play value to well over 50 hours (also keeping in mind that in these missions are where you will encounter the toughest of enemies). Even after completing the game, you may want to go back to complete your Collector's Books, which keep track of which enemies, recipes, items, and weapons you have yet to encounter. I feel that Legendia is the perfect RPG for those who might enjoy action games over the former. The story is captivating enough to keep you drawn in, while the battle system allows you to be fully in control of your actions. Many hard notch RPG players may scoff at Legendia as merely a button-masher in the shadow of such great turn-based games available on the PS2, such as Dragon Quest VIII and the Shin Megami series. Bottom line is that this is a very rewarding RPG for those who can stick with it, and the closing of the story finishes a very immersive gaming experience.